Welcome to the VisitPalestine.ps Online Media Center. In this section you will find useful material and information including digital brochures, photo library, press releases and other useful tourism related reports. Are you planning a trip to Palestine and the wider Holy Land? Let us help you plan your trip and organize any permits, interviews and field trips. Sign up here (MailChimp sign up form) to receive news for press or contact us at press@visitpalestine.ps. VisitPalestine.ps’General Manager and Founder, Sami Khoury, will be on the Palestine booth (ME260) and is keen to meet with the travel industry and media to promote www.visitpalestine.ps which provides a seamless online booking engine for hotels and tours as well as comprehensive visitor guides for 12 key cities and destinations across Palestine. The multilingual mobile responsive travel guide will also be available as a smartphone app from December 2016. Mr Khoury’s vision for visitPalestine.ps is to become the GO TO address for anyone thinking about visiting Palestine with a comprehensive and most up-to-date guide for Palestine, primarily for independent travel and business travellers but it will be useful to all visitors. “My strategy is simply: We go where you go, from planning to booking and while in Palestine touring through our online connectivity, mobile responsive multilingual site, active social media, booking engine, audio guides and soon to be launched smartphone app.” Said Khoury, “Offline visitPalestine.ps offers visitors information and assistance through its Center in Bethlehem which houses a tourist information office and boutique gift shop”, continued Khoury. The visitPalestine.ps website is currently available in five languages with more to follow and has more than 40 different tours available including city day trips, hiking tours and other community based experiences across the West Bank. It features hundreds of sites and attractions with photos, maps, opening hours and other practical information. The latest feature to be added are Audio guides for most of the attractions aimed at enhancing our visitor’s experiences. The Palestine Travel Guide app for smartphones (iphone and android) will contain the same information when launched in December. It will also be available offline to ensure visitors have help when it counts… while on the go. Subscribers signing up now will get notified of the launch and given free vouchers. treasures and experiences. He is proud that visitPalestine.ps and the United Nations Relief and Works Agency (UNRWA) are working together to help Palestine refugees across the region by signing an agreement that sees 5% of sales profit from visitPalestine.ps’ gift shop in Bethlehem and 10% of sales profit from the online gift shop donated to UNRWA to support its educational programs. Finally, Sami would also like to thank the sites main sponsor the Bank of Palestine for its continued support and partnership. On Thursday, 15 September, Visit Palestine and the United Nations Relief and Works Agency for Palestine Refugees in the Near East (UNRWA) signed a contribution agreement that will see 5 per cent of sales profits from Visit Palestine’s gift shop in Bethlehem and 10 per cent of sales profits from Visit Palestine’s online gift shop donated to UNRWA in support of the Agency’s education programme. 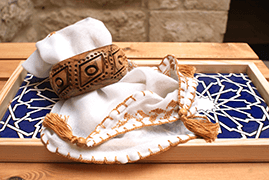 Visit Palestine is a tourism service provider based in Bethlehem that works to promote and support the local tourism industry in Palestine and offers travel information, tourism services and a gift shop offering products made in Palestine. This is the first agreement between Visit Palestine and UNRWA. For more information about the Open Bethlehem Campaign and Movie, please visit www.openbethlehem.org. We currently have an image bank of over 5000 images from across Palestine. Below are samples of some images per city. Feel free to contact us (info@visitpalestine.ps ) for any special requests or high resolutions images for your articles. In this section, you will find a selection of industry related news and reports. Please reference the authors / publication in any citation. www.travelpalestine.ps – The official site for the Ministry of Tourism and Antiquities which provides useful information on the main attractions and experiences available in Palestine. www.holylandoperators.com – Holy Land Incoming Tour Operators Association (HLITOA) which represents nearly 50 certified Palestinian inbound Tour Operators the specialize in organizing trips across the region including Palestine, Israel, Jordan and Egypt. www.nepto.ps – The Network of Experiential Palestinian Tour Operators (NEPTO). The site features profiles of over 20 independent non-profit organizations that work directly and indirectly in tourism and alternative tours and experiences across Palestine. www.enjoyjerusalem.com – Managed by the Jerusalem Tourism Cluster (JTC), this non-profit organization works to develop and promote tourism to East Jerusalem. The site features up to date information on sites, attractions and events across the city. www.thisweekinpalestine.com – This Week in Palestine (TWiP) is a very popular and highly reputable monthly publication that covers a wide array on information and stories from Palestine. A must have for any visitor to Palestine. www.paltrade.org – The official site for the Palestine Trade Center. The site provides useful business and economic information about Palestine and its leading economic sectors.